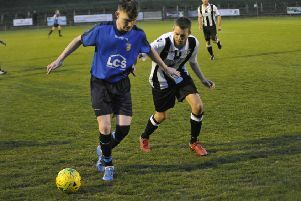 Bexhill United’s footballers notched up a victory and clean sheet in their first home game of the season. A goal in either half from Matt Cunnington and Craig McFarlane gave the Pirates a 2-0 win against second-bottom Southwick in Macron Store Southern Combination Football League Division One on Saturday. With the players having to contend with the strong wind in the first half, and the wind and rain during the second period, it was never likely to be a classic, but Bexhill were more than happy to take the three points. Bexhill opened the scoring in the 24th minute with another exquisite goal from Matt Cunnington. Hot on the heels of a wonder strike against Holmesdale the previous weekend, Cunnington cut in and unleashed a shot from 25 yards which dipped into the corner of the net, leaving the goalkeeper rooted to the spot. Cunnington, who had caused problems right from the start, was substituted as a precautionary measure just before half time. Light felt that Bexhill attacked better after the turnaround. Cunnington’s replacement, Zak Olujobi, showed good pace down the right and Bexhill made a good job of hitting Southwick on the break. But they had to wait until the 85th minute before killing the game off with a second goal. McFarlane’s far post header at a corner struck the upright and then the defender on the line and was ruled by the linesman to have crossed the line before it was hacked away. Light felt that Bexhill ought to have wrapped things up well before then. Perhaps the pick of the other chances was a four-on-one situation, which was scuppered when Jacob Shelton’s pass was intercepted by the only defender. Olujobi couldn’t convert a one-on-one opportunity and Shelton had two good chances during the second half. Southwick posed little threat on the whole, but did have one decent opening when the score was 1-0. Bexhill goalkeeper Dan Rose, who otherwise had a decent game, dropped the ball near the edge of the box and the resulting shot went well wide. Bexhill: Rose; Holden, Kidman, McFarlane, Ottley; Cunnington (Olujobi), Robertson, B. Trickett (Butchers), Giles (A. Trickett), Wheeler; Shelton.